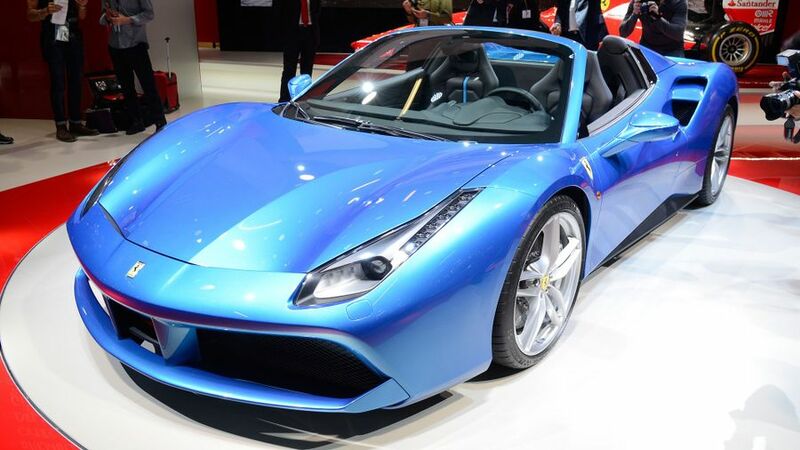 Ferrari has lifted the lid on its most powerful mid-engined convertible to date: the 488 Spider. Although the firm has produced more potent front-engined convertibles, the 660bhp 488 Spider has more horsepower than any of its open-top cars with the engine mounted in the middle. Based on the existing 488 GTB coupe, the Spider gets its huge performance from the same turbocharged V8 engine, which delivers peak power at a screaming 8,000rpm. Expect 0-62mph in 3.0 seconds, 0-124mph in 8.7 seconds and 203mph flat out. If you happen to be bothered about economy and emissions, they stand at 24.8mpg and 260g/km, respectively. The Spider’s electric folding hardtop opens in 14 seconds and sits flat above the engine when it’s down. Ferrari claims the cabriolet is just as sturdy as the 488 GTB even though most convertibles lose some rigidity compared to their coupe equivalents – but it is 50kg heavier than the GTB. Despite the weight increase, Ferrari reckons the metal folding hardtop is actually 25kg lighter than if the 488 were fitted with an equivalent cloth roof; it’s also 10kg lighter and 23% stronger than the 458 Spider it replaces and supposedly the most aerodynamic Ferrari convertible to date. As well as the lack of a fixed roof, there are also a couple of visual differences between the 488 GTB coupe and the Spider. The large buttresses behind the headrests are unique to the convertible, as is the windbreaker directly behind the seats. It’s actually a small, electric glass window, which has three different positions to adjust the amount of air allowed into the cabin. It’s not just for when the roof is down, either – you can also drop rear window when the hardtop is in place if you want to hear more of the engine howling away behind you at the same time as keeping the rain off. Despite this, Ferrari has actually muffled the Spider’s exhaust note a little. It’s slightly quieter than the coupe, so the noise isn’t quite as intense when you’re driving with the roof down at speed. 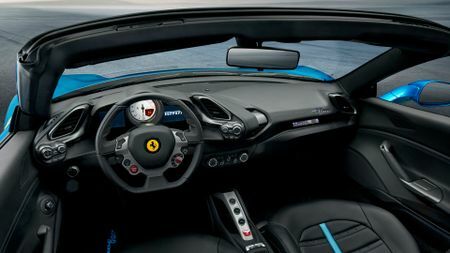 Ferrari has also made the Spider’s suspension a little softer than the GTB coupe’s, the thinking being that those who buy the convertible are less likely to use it on a track than coupe owners, so the ride will be more forgiving on the road. The 488 GTB coupe starts at £183,974 and it’s expected that the Spider convertible will cost around £200,000 when it goes on sale in spring 2016. Interested in buying a Ferrari 488?